Welcome to Borley Rectory, the most haunted house in England. The year is 1926 and Sarah Grey has landed herself an unlikely new job – personal assistant to Harry Price, London’s most infamous ghost hunter. Equal parts brilliant and charming, neurotic and manipulative, Harry has devoted his life to exposing the truth behind England’s many ‘false hauntings’, and never has he left a case unsolved, nor a fraud unexposed. So when Harry and Sarah are invited to Borley Rectory – a house so haunted that objects frequently fly through the air unbidden, and locals avoid the grounds for fear of facing the spectral nun that walks there – they’re sure that this case will be just like any other. But when night falls and still no artifice can be found, the ghost hunters are forced to confront an uncomfortable possibility: the ghost of Borley Rectory may be real. And, if so, they’re about to make its most intimate acquaintance. I got a really bad craving to read this book during December and picked it up as soon as I’d read A Tale of Two Cities and a little bit of light relief. I was looking forward to spending a few evenings in the company of an intrepid ghost hunter and his plucky assistant and chasing down some spooks. I did get that after a fashion but in the end, I came away from The Ghost Hunters feeling a little bit disappointed. 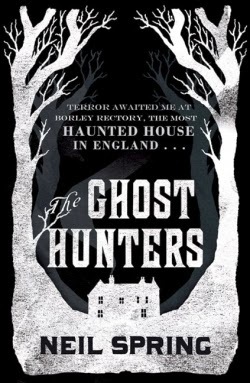 I think that part of the reason why I felt a bit let down was that the story was billed as a terrifying account of the “most haunted house in England”, Borley Rectory. Although Borley Rectory and its spooky goings on obviously are a focus, they aren’t really the main focus. Rather, The Ghost Hunters is a partially-fictional version of the life and work of Harry Price, “one of the most controversial and famous psychic researchers and authors in the history of spiritualist studies” according to this website. It’s clear that an awful lot of work has gone into putting this book together and as historical fiction, it really is an impressive mixture of fiction and fact (including samples from real letters and quotes from people such as Sir Arthur Conan Doyle). But as a thriller? There’s just something missing and I found that I was left wanting to know more about the history of the Rectory and its ghostly inhabitants. The first two thirds or so of the novel are full of foreshadowing. I actually like a bit of foreshadowing because I like to know what I have to look forward to but there was too much even for me. In the first chapter of the main narrative, Sarah says, “Only now, with fear in my heart, do I properly understand what he meant. For now I know what it means to feel the pain of regret, and to wish it gone”. It got to the point where it felt almost as though she was saying something similar every time an apparently key decision was taken. There being so much of the “If I’d known then the terror that awaited me…” and “Would I have done the same if I’d known…” type comments made me feel as though what I was reading was the preface to the main event, rather than something that I could just get on and enjoy for what it was. As the narrator, I found Sarah Grey a bit of an enigma but I liked that there was clearly something that she was holding back. I’m becoming more than a bit of a fan of the unreliable story-teller, it seems. On the one hand, she’s out pursuing an unorthodox career, supporting her mother and herself financially and running her home, and doesn’t appear to think twice before jumping in to investigate strange goings on that have everybody else running scared. On the other, she continues to tolerate appalling rudeness from her mysterious employer without so much as a peep for quite large portions of the novel. Her behaviour is explained in the final few chapters so I won’t go into too much detail but the secrets and deception that are a key theme of the book make for some curious reading. As is often the case with historical fiction “based on real events”, I found the Author’s Note at the end to be one of the most interesting bits. Far more of the characters and their back stories were drawn from actual people than I’d guessed and I do have a morbid interest in reading about people’s accounts of their experiences with the Other Side, considering that I’m actually quite the sceptic when it comes to the paranormal in real life. It certainly added something to the feeling of unease that I was left with after finishing the book late on Thursday night with the wind and rain pelting my windows and meant that I did close it with a bit of a shudder. I do also have one small criticism of the format that is almost certainly just me being picky but it did bug me a couple of times so I’m still going to mention it. The story is peppered with footnotes that fill in the background on some of the slightly more obscure phenomena that are being discussed and cite where real newspaper articles or excerpts from Harry Price’s books are used, which are fascinating. The footnotes, however, are at the end of the chapters as opposed to at the bottom of the page. Perfectly valid I’m sure but because I like to read the footnotes at the time they’re mentioned, it meant that I had to find and flick to the end of the relevant chapter just to read the footnote and then go back to the story. A minor thing but it did disrupt my reading more than a few times. It sounds as though I hated The Ghost Hunters. I really didn’t. The first third or so was great, the middle third dragged and seemed to go round in circles but the final third returned to the earlier strong form. I wouldn’t hesitate to pick up another book by Neil Spring in the future because there was a lot that I really did enjoy about his writing. This is a book that is worth reading but it isn’t the white knuckle ride of terror that the cover suggests it is. Overall: At times chilling and nail-biting, this is a ghost story for fans of historical fiction with a little more time to invest in getting their ghoulish rocks off. The story takes a while to build up but when it does, it’s definitely worth your time. If you can get through the middle couple of hundred pages, you’ll be rewarded in the end.